Jacksonville Economic Snapshot, which includes March 2018 data. St. Johns County is home to more than 200,000 people that are served by two municipalities and the County Government. 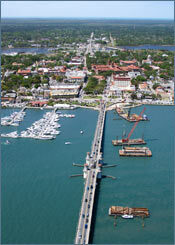 St. Johns County has two incorporated cities St. Augustine and St. Augustine Beach. Unincorporated communities include Ponte Vedra, Hastings, Switzerland, Crescent Beach, Tocoi, Bakersville, Picolatta, Orangedale, Fruit Cove, Summer Haven and Vilano Beach. St. Augustine, the county seat, was incorporated under Florida law on December 2, 1924. It has a city manager and an elected commissioners form of government. St. Augustine Beach was incorporated on January 1, 1960 and also has the mayor/council form of government. A recent study places St. Johns County as the 14th fastest-growing county in the United States. Total population in St. Johns County grew 54.3% 2000-2010, compared to Florida's growth rate of 17.6%.